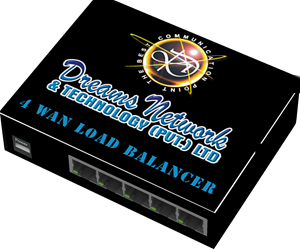 The DNT Failover is a four port Firewall Router with WIFI, which support VPN Client,DHCP Server, Load Balancing, Link Aggregration and many more! The device is powered by a fast 650MHz, and also includes a temperature sensor and voltage monitor. DNT Failover includes LinuxOS - the operating system. One small device - with all the power of Balancing Topologies. Adapter power supply is included.